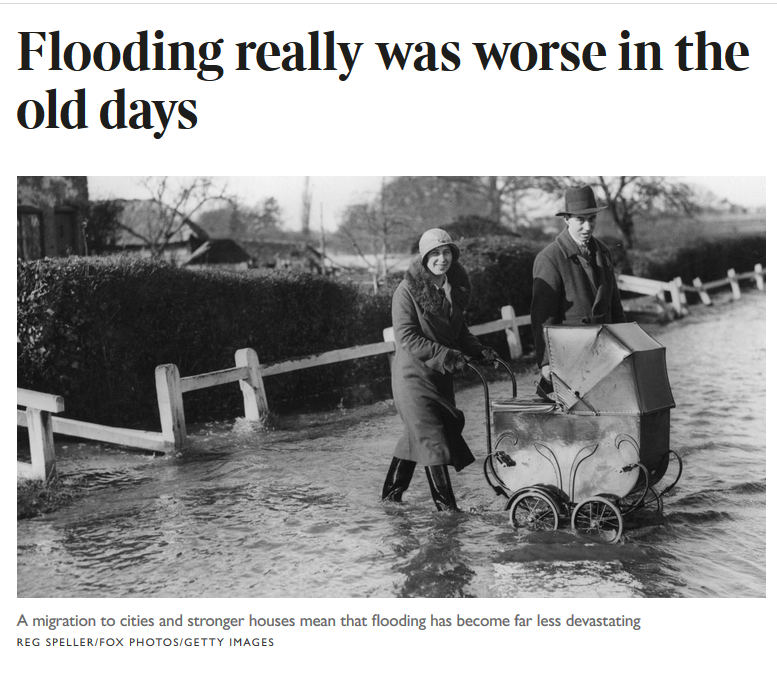 Flooding really was worse in the old days! Monty Python’s four Yorkshiremen, who bragged of spending their childhoods in septic tanks or at the bottom of a lake, would be delighted to discover that floods really were worse when they were lads. Dominik Paprotny, who led the study, said that this was probably because people had migrated out of the countryside into cities, which tended to be better protected, while houses now tended to be more soundly built and flood defences were stronger. The internal combustion engine and the invention of the helicopter have also made evacuating people a much easier prospect than in the Victorian era. Working from more than 300 sources including old books and newspaper clippings, the team created a list of 1,564 “damaging” floods that occurred between 1870 and 2016. They then made a map of how riches and the population had been distributed across 37 European nations over the same period. The model was detailed enough to be broken up into 100m squares. The number of bad floods per year did increase from about three in the late 19th century to more than 20 in the early 21st. However, records are heavily skewed as most of the middling-sized floods that happened before 1950 have simply passed out of memory. When the academics tweaked the data to take this into account, they found that the upward trend vanished: if anything, the frequency of “extreme hydrological events” went down during the 20th century, despite global warming. Mr Paprotny said that climate change had reduced some flood risk factors, such as sudden thaws, but had made others worse.